Masking allows you to discard some of the animation data within a clip, allowing the clip to animate only parts of the object or character rather than the entire thing. For example, if you had a character with a throwing animation. If you wanted to be able to use the throwing animation in conjunction with various other body movements such as running, crouching and jumping, you could create a mask for the throwing animation limiting it to just the right arm, upper body and head. This portion of the animation can then be played in a layer over the top of the base running or jumping animations. See in Glossary to apply a mask at run-time. This page relates to masking in the import settings. See in Glossary, expand the Mask heading to reveal the Mask options. When you open the menu, you’ll see three options: Definition, Humanoid and Transform. See in Glossary from your project. If you want to create a one-off mask just for this clip, choose / Create From This Model /. If you are going to set up multiple clips with the same mask, you should select / Copy From Other Mask / and use a mask asset. This allows you to re-use a single mask definition for many clips. 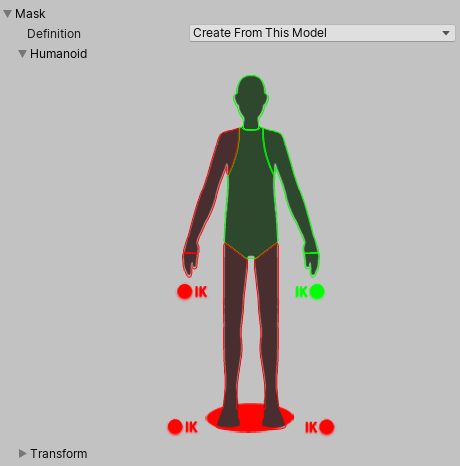 When Copy From Other Mask is selected, the Humanoid and Transform options are unavailable, since these relate to creating a one-off mask within the inspector for this clip. 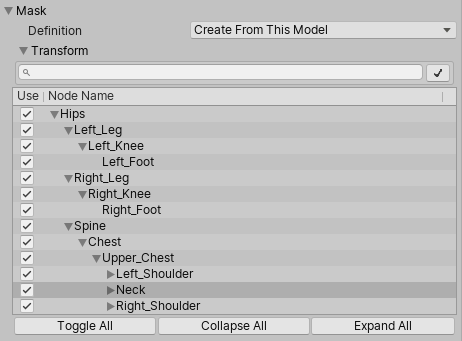 This option allows you to specify a mask based on the individual bones or moving parts of the animation. This gives you finer control over the exact mask definition, and also allows you to apply masks to non-humanoid animation clips.